Please only use the parking places provided. Max 4 cars. Please also respect the neighbours privacy and boundaries. We'd like you to treat Yannons as you would your own home, with the same freedom and consideration. All power and light is included but this is an old house without double glazing so please consider the environment and don't waste heat unnecessarily. You may get more benefit with a warm jumper in winter. Out of consideration for the local residence please do not party late or play loud music, particularly in the garden. Please return borrowed items in good, clean condition before the end of your stay. Bathroom towels provided must not be taken outside the house. Please inform us of any breakages so they can be replaced. Reasonable accidental damage will not be charged for but careless damage or additional cleaning may result in a reduction of deposit returned. Instruction manuals for appliances are to be found in the kitchen. Please let us know if you have any problems with the equipment. 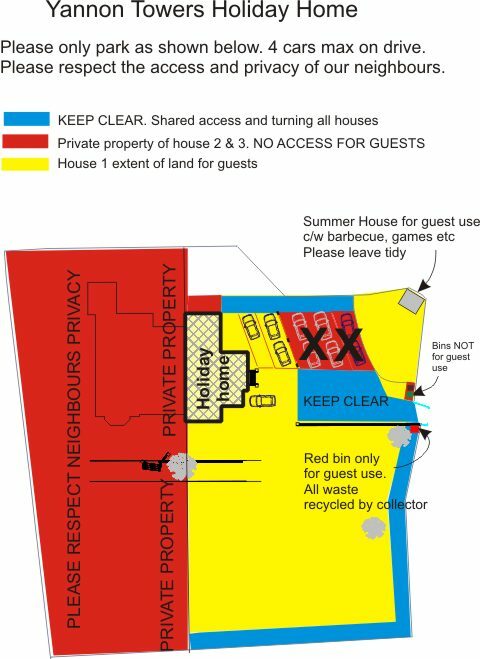 Please look at the garden area plan and respect the boundaries and parking area of the other houses. Because the building is listed we are not allowed to mark the dividing boundaries clearly. Please note that the fire alarms are linked on all floors. Pressing any alarm will silence all alarms so please make sure there is no fire on another floor. The door to the tower viewing area is bolted closed as it has not been made safe yet with suitable guardrails. This area is unsuitable for children but adults may go onto the tower at their own risk. The summer house contains various bikes, boards, crab lines, beach gear etc. of unknown condition but available for guests use. Please lock the summer house after use. The key is on the notice board hook.